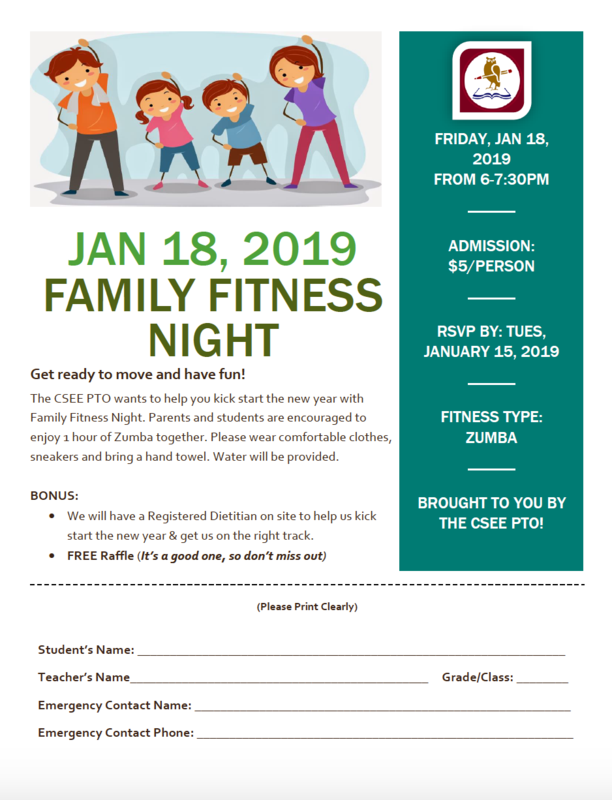 Don't Forget to RSVP to Attend CSEE's PTO Sponsored Family Fitness Night This Friday, January 18, 2019! January 14, 2019 - Get ready to move and have fun with CSEE's PTO Sponsored Family Fitness Night! The CSEE PTO wants to help you kick start the new year with Family Fitness Night. Parents and students are encouraged to enjoy 1 hour of Zumba together on Friday, January 18, 2019, from 6-7:30 PM. Please wear comfortable clothes, sneakers, and bring a hand towel. Water will be provided. Admission is $5.00. To RSVP, please return the attached registration form by TOMORROW, Tuesday, January 15.